Have you ever brought a new puppy home? That new little bundle of energy bursts through the door and into your heart, with endless helpings of exuberance and play. Sure, it lacks some of the composure and tricks of a big dog, but the desire to keep playing until exhaustion keeps the smile stuck to your face. Bringing the Ninja 400 home is just like that. Each day, the little Kawi needed its exercise, and I was only too happy to oblige. C’mon, you little scamp! Let’s go run some errands across town, and we’ll take the long way back through the country! Sometimes, the bikes I’m assigned wear me out just trying to manoeuvre them out of the garage [Nobody’s feeling sorry for you, Jeff – Ed.]. The Ninja 400 is so light (164 kg – 8 fewer than last year’s Ninja 300), it feels as if it could be picked up and carried home if it ran out of gas. Which it wouldn’t because the trip computer (yes, it has one!) claims the little Ninja was sipping fuel at 4L/100 km, a figure that could embarrass a Prius. And that was with me pretending I was CMG’s Jacob Black chasing the pack in a race! Everywhere we went, I revved the Kawi up to 8-, 9-, 10,000 rpms or more, even around town. Sure, the 399-cc parallel-twin isn’t the smoothest or most melodic engine around, but it always seemed eager to please, and that featherweight mass, combined with a short-rider-friendly seat heat (785 mm), meant the Ninja was great at slicing through urban traffic. The Ninja 400 is narrower than the 300 as well, thanks to the engine serving as a stress member in the structure of the bike. This creates less mass and puts more bulk into the frame. That engine, Kawasaki wants you to know, is all new, not just a bored-out version of last year’s 300. 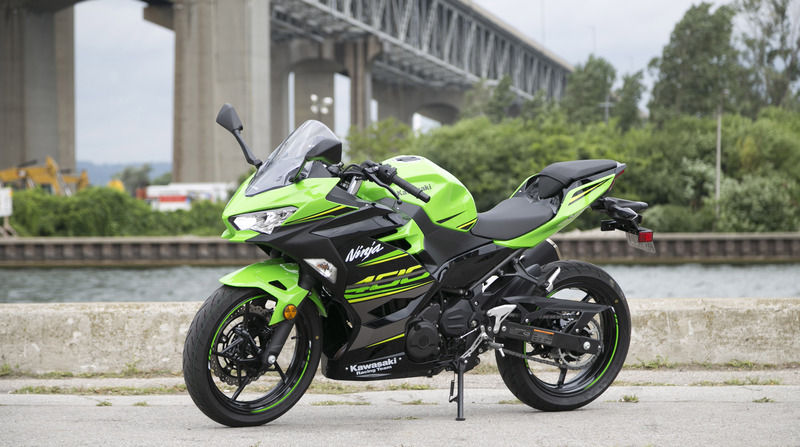 It dishes out just under 50 horsepower, which means in the Canadian Superbike Championship series where the Ninja 400 goes head-to-head with larger bikes like Honda’s CBR500R, the Kawi is the only bike that needs to be restricted because it’s too powerful. I’ve ridden the Honda and think it’s a good machine for those just starting out in riding, but I never had the fun on it that I’ve had on the Ninja 400. The Kawasaki’s engine seems to have more character, and overall, the bike simply has more sizzle than the more conservative Honda. It gets me all wound up in the best possible way. 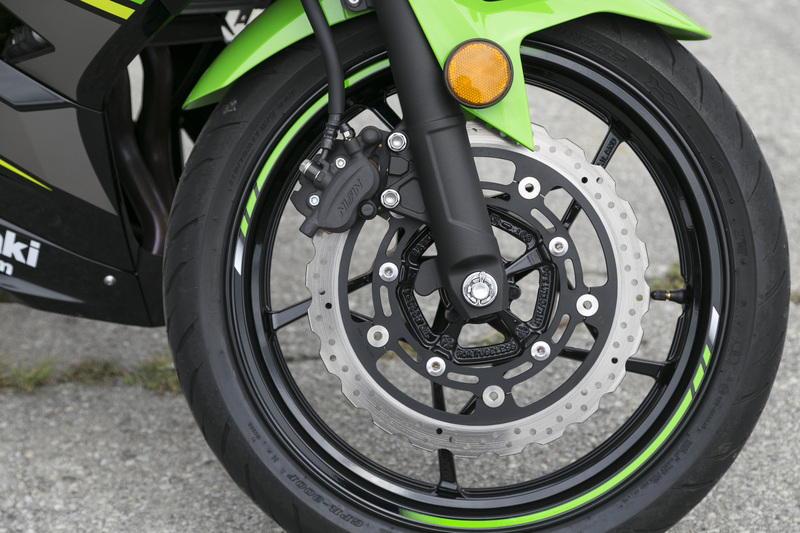 Braking is handled by a 310 mm semi-floating front disc, clamped by a dual-piston caliper. The rear features a 220 mm disc, also clamped by a dual-piston caliper, and ABS is optional, but not fitted to my tester. For both around-town and back-road duties, this set up is adequate, if not outstanding. And like the brake effort, the clutch pull is very light and delicate, again making it very user-friendly, even for new, or smaller riders. How is it on the street? All this is to say that the Ninja 400 is mostly a proper sporting bike. No, it’s not a ZX-10 or even a ZX-6, but if you want to have gobs of affordable, reliable fun on a track, you could do worse than the Ninja 400. This is the first bike I’ve ridden this season with less than 100 hp and although it was down on bragging rights, it was more enjoyable than many of the other much more powerful machines I’ve thrown a leg over recently. Most Ninja 400 buyers won’t take their bike to the track, and that’s okay too, because it’s a great commuter bike. In addition to that fuel efficiency, lively acceleration and nimbleness (easy in traffic, easy in the parking garage), the Kawasaki won’t demand yoga training, thanks to a reasonable riding position. The handlebars are mounted high enough to minimize the strain on the wrists and neck – they’re higher than last year’s Ninja 300. The seat is hard, though, and offers little padding; riders probably won’t want to cross the country on the 400, but for an hour at a time, it’s no problem. 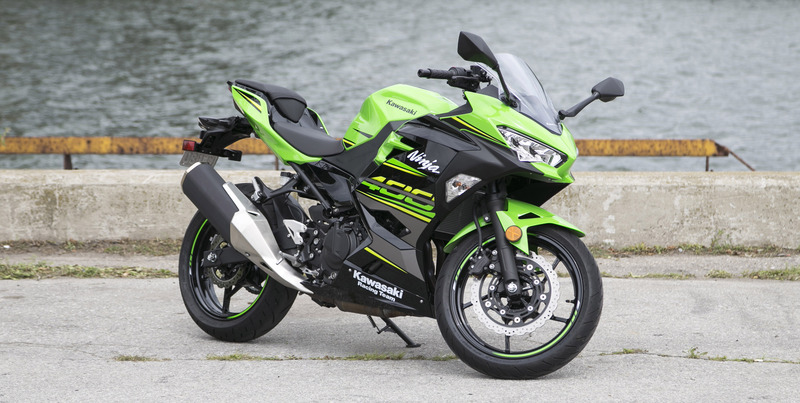 Kawasaki has given the Ninja 400 an impressive gauge package, too. The dominant analogue tach is easy to see and seems appropriate for this bike. 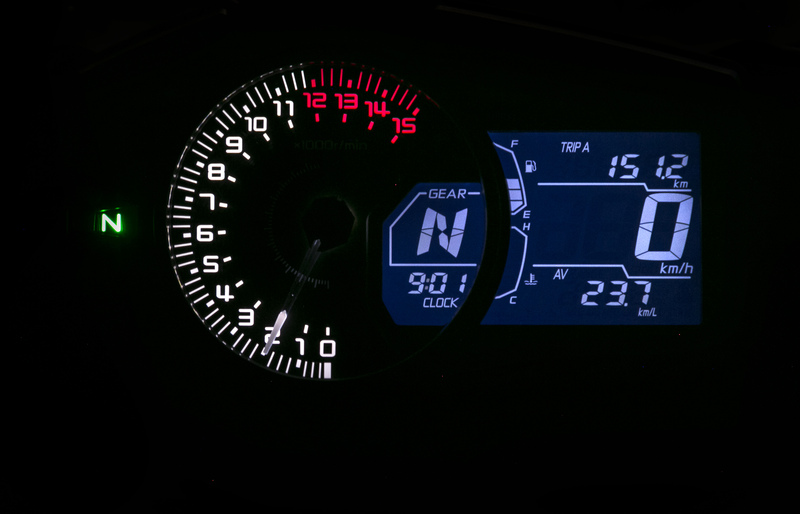 Adjacent is a digital display with speedometer, fuel gauge, trip computer and even a gear indicator. At faster highway speeds, the Ninja 400 copes much better than the small-displacement beginner sport bikes did in the days of yore. Although spinning around 7,000 rpms, the new Ninja is pleasingly stable at just above the legal limits, and its sport-bike body work and windshield provide decent protection from the wind. Plus, there’s still a reasonable amount of passing power left even at 110 – 120 km/h. A new puppy will test your patience from time to time, and so too did the Ninja 400. 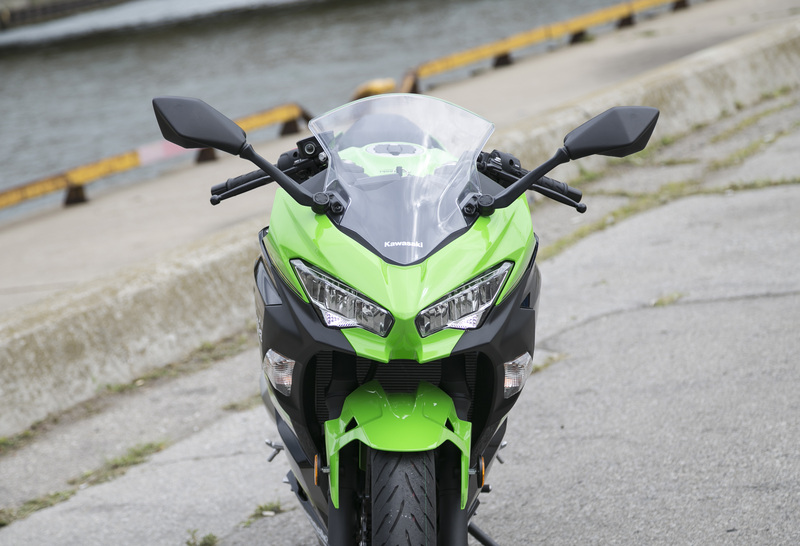 Once, in stop-and-go traffic with my mirrors filled by a truck’s grille, the Kawi exhibited a moment of disobedience, refusing to engage first gear for several tries. It occurred a few other times around town as well, requiring some stern words before doing as it was told. Those instances aside, the little Ninja would zip up and down through the gears with enthusiasm. 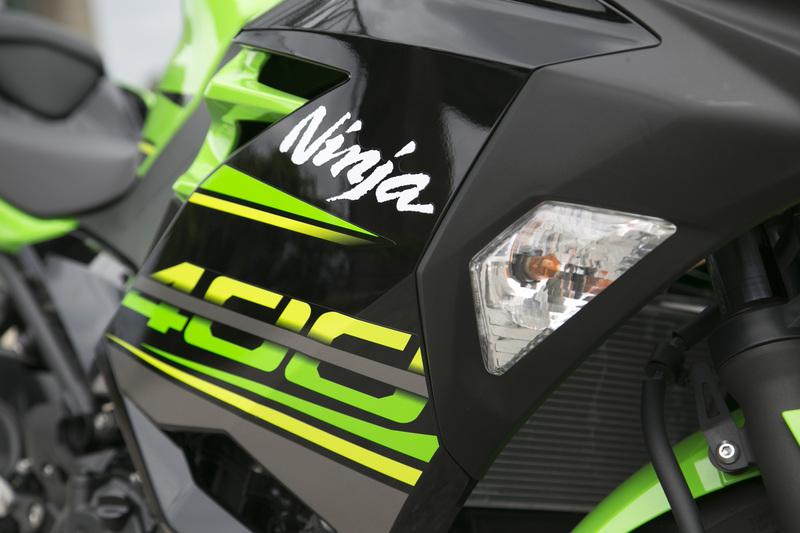 The Ninja 400 is great as a commuter, serious fun on back roads, and can even excite its owner in lightweight racing, but it doesn’t cost an arm and a leg. With a starting price of $5,799 without ABS, and $6,199 with ABS, the Ninja 400 undercuts the Honda CBR500R by more than a grand. If the solid black, red or blue paint schemes offered by Kawasaki Canada don’t do it for you, the Kawasaki Racing Team livery seen on my test bike is a $200 upgrade, though it does boldly announce the 400-cc engine size – you need to be secure about that sort of thing. The Ninja 400’s most sporting competitors, the Yamaha R3 ($5,899) and KTM RC 390 ($5,995), do cost a little less. Those meant to have a dog in their life will love it even after the puppy-hood novelty wanes. 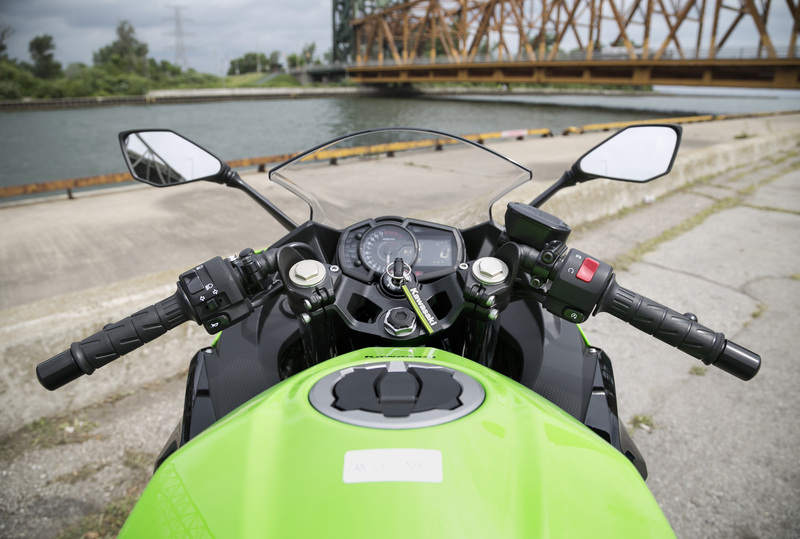 Kawasaki’s Ninja 400 offers far more capability and usability than previous small-displacement, entry-level bikes, which means it’s unlikely a new rider will grow out of it within a season. It’s the sort of bike that should cause all riders alike to laugh aloud at its playful nature. And if it doesn’t, you might want to rethink why you ride at all. I think I need to add a small, lightweight sport bike to my garage now. And I need a puppy. Whatever happened to Kawasakis positive neutral finder, A big deal years ago. Might look nice next to my KTM 390 DUKE! Rumour has it Yamaha’s next R3 will be a triple. The little bike market could be the hottest market. Versys dammit. When will android learn to spell properly? I am eagerly awaiting a versus 399.